Tag line: "They wanted something for nothing. He gave them nothing for something"
It was in the early 1990s that Alan Conway, a gay alcoholic living in London, started telling people he was the famous film director Stanley Kubrick. Most believed him, and were more than happy to buy him a drink or two, in the hopes he’d give them a part in his next picture. 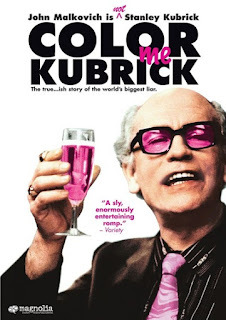 Released in 2005, Color Me Kubrick is an often-comedic look at Alan Conway and those he duped, and while the movie does eventually wear out its welcome, star John Malkovich manages to always keep things interesting. Even though he looked nothing like the man (for one, Stanley Kubrick had a beard, while Conway was clean-shaven), Alan Conway (Malkovich) convinced dozens upon dozens that he was Stanley Kubrick, and would use his “star” status to get free booze and other gratuities. Conning everyone from a punk rock group (promising to feature their music in his next film) to a bar owner trying to expand his business (as Kubrick, he co-signed for the guy’s small business loan), Conway managed to keep up the charade for a number of years. Those he fooled were usually too embarrassed to press charges, and when he’d run into a former mark on the street, he would quietly slip away. It wasn’t until he hooked up with established singer / comedian Lee Pratt (Jim Davidson) that Conway’s scam began to unravel, and to his amazement, once his deception was revealed, Alan Conway himself became a minor celebrity! As Conway, Malkovich is flat-out hilarious; aside from Conway's often terrible American accent, he doesn’t know all that much about the real Stanley Kubrick or his work (one potential victim exposes the lie by saying he loved his movie Judgment at Nuremberg, which was actually directed by Stanley Kramer). What Conway does have, though, is a magnetic personality, and the uncanny ability to make people listen to him. It’s this quality that Malkovich brings to the forefront, and we laugh at just how far he’ll go to keep up the charade (at a punk rock club, Conway narrowly escapes the wrath of a previous victim by jumping into a cab, then, having convinced the driver he’s Kubrick, he cons the poor guy into giving him a free ride). Along with the humor, Color Me Kubrick also explores the tragic side of this story; an alcoholic who couldn’t support himself, Conway did, at one point, fall in love for real, only to have the relationship collapse when he confessed he wasn’t Stanley Kubrick (even when his feelings were genuine, Conway lacked the self-confidence to simply be himself). In addition to Malkovich’s bravura performance, Color Me Kubrick features music from some of Kubrick’s best-known films, used in a way that, at times, is quite funny (the dramatic "Also Sprach Zarathusra", such an integral part of 2001: A Space Odyssey, plays during a very ordinary scene in which Conway walks into a laundromat). Alas, even at 85 minutes, Color Me Kubrick feels a bit long; after a while, the novelty of its story begins to wear off. Fortunately, John Malkovich is on-hand to keep things rolling, and while I can’t say Color Me Kubrick is a perfect comedy, the actor makes you want to stick around to see how it all ends.